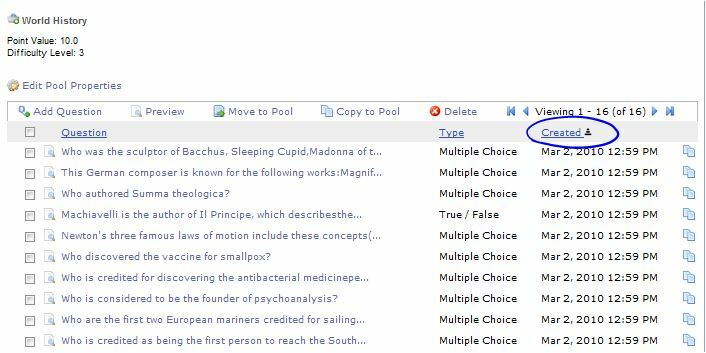 To access a question pool, click on its title. From this screen, you can add, edit, view, copy, move, duplicate, and delete questions. Add Question: Just click on the Add Question link. Edit Question: Click on the text portion of the question (hot link) to open it up for editing. You’ll see the same window as when you added the question. You can click on ‘next’ or ‘prev’ to move through the pool and edit other questions without returning to the main pool list. View Question: Click on the little page icon to the left of the question text to view it as it will be seen during the test. You’ll also see the answer key, as well as other items such as add reason for answer, model answer, feedback, and hints, if you added them. To continue previewing more questions in the pool, click on the ‘next’ or ‘prev’ buttons. Preview All Questions: Check the box of one or more questions that you would like to preview and then click on Preview on the action bar. Or, you can preview all of the questions in a pool at once by clicking on the preview button on the left of the pool title. In the below example, clicking on the preview icon will bring up all 48 questions of the Quiz 2 pool. Copy to Pool: This feature allows you to copy one or more questions from one pool to another. The two versions are unique copies, so you can edit one version without affecting the other. To do this, check on the question(s) you want to copy, then on the Copy to Pool link. A page appears listing other pools. Select the pool you want to copy to and click on OK.
Click on Cancel if you decide to abandon the copy operation. Move to Pool: This feature is similar to copy to pool, except that it moves questions out of the original pool and into another pool. You are not creating copies; you are moving the selected items from one pool to another. To do this, check on the question(s) you want to move, then on the Move to Pool link. A page appears listing other pools. Check next to the pool you want to move to, then click on OK.
Click on Cancel if you decide not to move. Duplicate Question: There may be times when you want a duplicate question and reuse it in some other way. To duplicate a question, click on the duplicate icon, located to the far right of the question row. Immediately a second version of the question appears in the list. It is an identical version of the original EXCEPT it has a different ID number to help you identify the copies. You can change either question without affecting the other. To delete one or more questions permanently from a pool, check the box in front of the question(s), then check the Delete link at the top. You will be prompted to confirm whether you want to proceed or not with the deletion. You cannot undo deletions, so be careful when confirming deletions in the software. Click the Delete button to proceed with the deletion or cancel to abandon the process. Your pool questions are sorted by creation date by default. You can change the default sort order to by type or alphabetical. 1) If you want to sort them into alphabetical order, click the Question header at the top of that column. They are sorted into A-Z order. Click again to see Z-A order. You new sort order will remain in effect when previewing your questions. It will return to by ‘created’ date when you leave the Question Pools area. 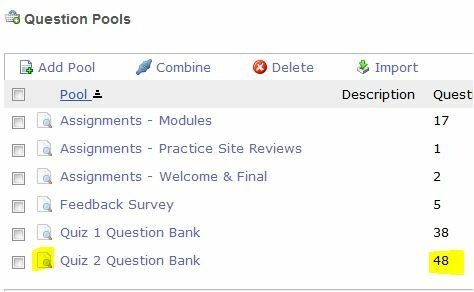 When you’ve added each of your pools and added questions to them, click Return at the bottom of the last Question Pool. You will return to the list of all question pools. You can see your question pools and information about each pool. Working our way across the row, we have a check box, an icon to preview one or more questions, a hot link of the pool title which takes you to its questions, a description if provided, number of questions, how many points each is question is worth, the edit properties option and the difficulty level. The edit properties option is where you can adjust the pool title, description, points, and difficulty. The last icon allows you to make a duplicate of the pool – down to the last question. You can combine questions from two or more pools into a new pool, that includes unique copies of all questions from the combined pools that you selected. To combine two or more pools, check the box to the left of the pools you want to combine into a new one. Then click on the Combine link at the menu. You’ll be asked to set all the properties: title, description, point value and difficulty. Upon clicking on Done, you’ll have a new pool which includes all the questions from all checked pools. The combined pool questions are not linked to the original pools; they are unique copies, so editing questions in either pool will not affect the text of questions elsewhere. If you click on the Combine link without checking pools first, you’ll get a warning. The ID number at the bottom right of each pool page will be unique. To duplicate a pool, click on the Duplicate icon. It’s the one at the far right of the pool row. Immediately, a second version of the pool appears in the list. You can recognize the duplicated version as it has the date and time it was copied appended on its title. You can modify either pool’s properties without affecting the other. As you may suspect, it’s easy to delete a pool. Check the box in front of the pool, then check the Delete link at the action menu. This brings up a pop-up window asking if you’re sure you want to delete the pool. Click that Delete button and it will be gone forever more. There is no undo command! The list of question pools can only be sorted in alpha order by the title of the pool. To do so, click the Pool column header once for A-Z order and once again for Z-A order.